Standing 13,671 feet (4,167 meters) in height, Morocco's Mount Toubkal holds the distinction of being the tallest mountain in Northern Africa. Located in the heart of the Atlas Mountains, Toubkal is a popular trekking peak, drawing thousands of visitors on an annual basis. And while it may not be as tall as its African sibling Mt. Kilimanjaro, it still holds a significant challenge for hikers looking to reach its summit. 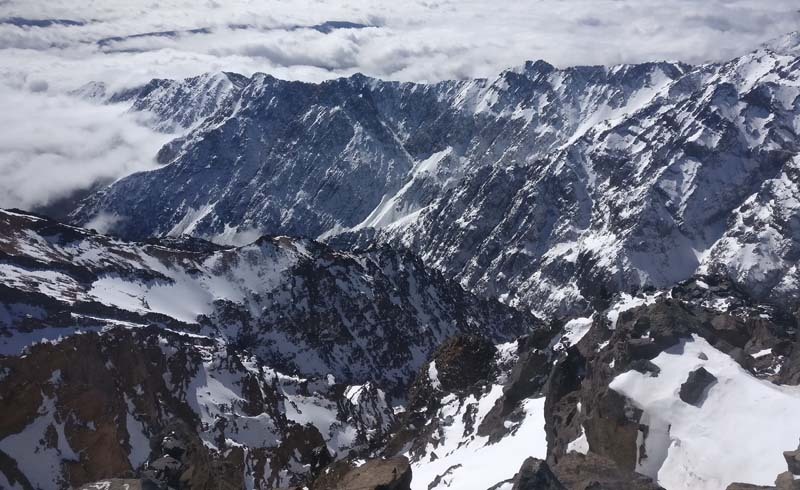 If you're planning on visiting Morocco in the near future and are looking for an adventurous outing, a Toubkal climb may be exactly what you're looking for. But before you set out for the High Atlas, here is everything you should know. While Toubkal is mostly a non-technical climb –– meaning it doesn't require ropes, safety harnesses, or crampons –– it still offers a moderate challenge for experienced hikers. The mountain's height can make a trek to the summit a difficult one for those who aren't use to the thin air that comes with altitude or aren't in good physical condition. That said, this is an approachable climb for anyone who has a good sense of adventure, doesn't mind roughing it a bit, and enjoys a walk along an alpine trail. What Toubkal lacks in altitude however, it more than makes up for with prominence. The mountain ranks 36th in the world in terms of total prominence, which is the distance from its base to the summit. 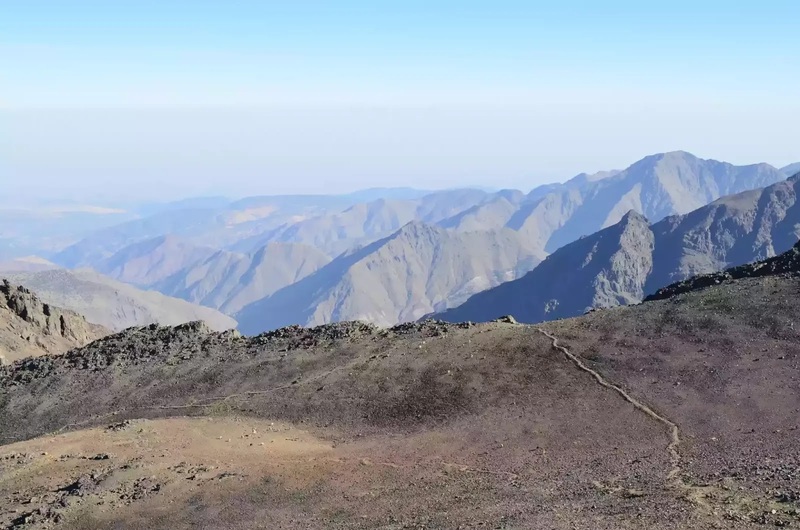 In this case, Toubkal rises 12,320 feet (3755 meters) above the surrounding landscape, and climbers will have to hike up that entire distance to reach the summit. That's a lot of vertical gain and loss throughout the hike. As noted, Toubkal is mostly a non-technical climb, though loose scree on the upper slopes of the peak can make trekking just below the summit a challenge. During the summer months, hikers can scramble up this rock and debris without too much trouble, but in the winter, ice and snow can add an additional layer of difficulty. During those times of the year, it may be necessary to use an ice axe or crampons to make your way to the top. Much like climbing Kilimanjaro, a trek to the summit of Toubkal is very safe. The trails are clearly marked and very easy to follow. For the most part, this is simply a challenging hike to the summit of a tall mountain with limited exposure to any kind of real danger. Serious injuries to climbers are a rarity, as are fatalities. That said, there are certain inherent risks that come with hiking in high alpine environments, including the chance of contracting altitude sickness. This can lead to headaches, upset stomachs, and cause nausea, amongst other symptoms. Altitude sickness can also make it difficult to sleep or maintain an appetite as well. In severe cases, it can even lead to severe illness or death. 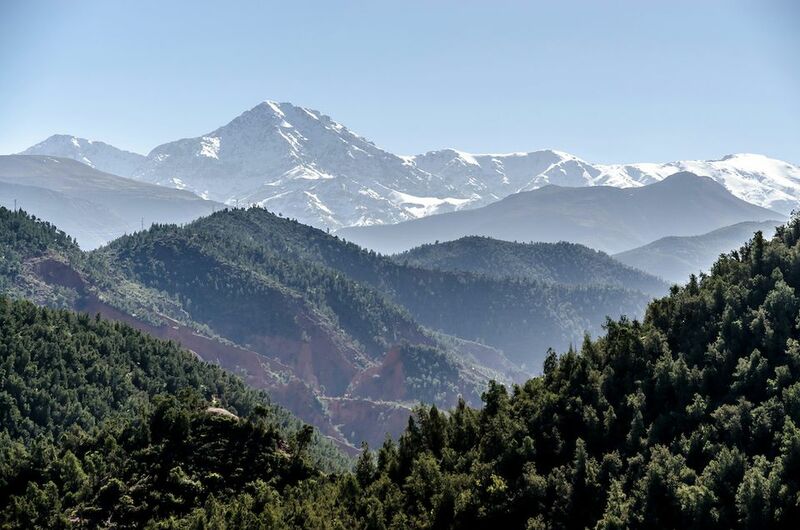 Fortunately, Toubkal's relatively low altitude means that these issues aren't a concern for most trekkers, but it is important to be aware of them before setting out. You do not need to hire a guide to climb Toubkal. If you are an experienced backpacker and feel comfortable in the wilderness, you can choose to go it completely alone, and many trekkers do just that. Hiring a guide does bring some nice benefits however, including connecting with like-minded travelers on the trail and having someone to show you the best way to get to the summit. A guided trek also brings a higher level of safety too, as you'll have someone who is familiar with the mountain watching over you and checking on your health and wellbeing along the way. If you're looking to join a guided trek, there are a number of good ones that can be found online, and we'll share some of our favorites below. But if you decide to wait until you're in Morocco to hire someone, that is fine too. 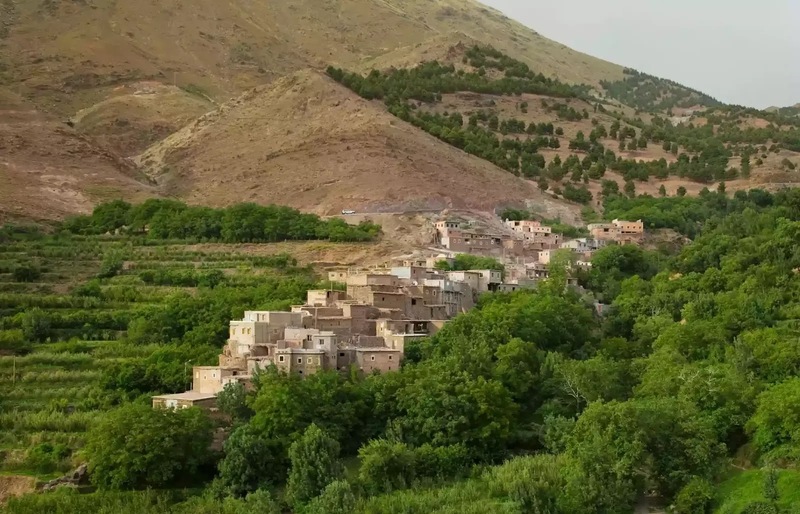 You'll find plenty of local operators to book with in Marrakech and Casablanca, as well Imlil, a village located close to the mountain itself. One of the most common questions that hikers have is "how long does it take to hike to the summit of the mountain?" The actual number of days varies depending on whether you hire a guide or choose to go it alone, as well as your own physical conditioning. Most guided Toubkal treks spend three days on the mountain, with the bulk of the climbing done on the first two days, with the descent coming on the third and final day. Some tour operators may add an extra day or two to help with acclimatization or for bagging smaller peaks nearby. If you're making a self-guided trek up Toubkal, you can choose to go at whatever pace you like, spending as few as two days or many more. However, chances are if you feel comfortable enough going it alone, you'll probably be able to complete the climb in two to three days as well. While it is possible to climb Mount Toubkal at any time of the year, there are certain months that are better than others. In the spring, April and May provide cool, comfortable temperatures, with little rain or snowfall, and in the autumn, September and October tend to mirror those conditions. During the summer months (June, July, and August) temperatures can be quite hot, making it a difficult time to be on the mountain. You'll still find plenty of trekkers making their way up Toubkal's slopes, but the warm conditions bring an added level of challenge. In the winter, the mountain tends to be less crowded, but conditions are more challenging too. Snow and ice can make sections of the trail difficult to walk on, and it is not uncommon to use crampons or ice axes when approaching the summit. Less experienced climbers and hikers are encouraged to avoid December, January, and February, as high winds, cold temperatures, and unexpected snowstorms can increase the level of danger. If you're looking to avoid the crowds, the shoulder seasons of late May/early June and late August/early September are a good time to go. In both cases, the weather tends to be manageable, but trekkers haven't necessarily started showing up in large numbers yet. As already mentioned, most Toubkal trekking itineraries are usually about three days in length. They tend to start in the village of Imlil and head up into the mountains from there. The early stages of the trek are easily managed, with only a slight, gradual rise in altitude. The day 1 route passes through another village or two along the way, and it is not uncommon to encounter vendors along the path who are selling food and drinks too. The trail is very easy to follow and offers little in the way of challenge. After about four or five hours of hiking you'll reach the CAF Refuge, your campsite for the nights spent on the mountain. The Refuge can be crowded depending on how many other hikers are on Toubkal, but generally speaking, it is a relaxing place to get some sleep prior to summit day. The next morning you'll launch your attempt on the summit at about sunrise. The second day brings more challenging trekking with steeper trails and rock-filled scree fields. It takes about three to four hours to reach the top, which is marked with a colorful, pointed tripod. On a clear day, the views from the peak can be very nice, but oftentimes, high winds can blow dust and sand into the air, obscuring even other mountains in the Atlas Range. After spending some time at the summit, you'll head back down. The descent tends to be faster, requiring only two or three hours, but tired legs can make the hike a surprisingly difficult one. Loose scree can make for precarious footing at times, but trekking poles can prove invaluable for keeping your balance. Once back at the Refuge, some trekking groups will elect to continue back to Imlil, completing the climb in just two days. Others will spend another night at the campsite before proceeding down the following day, which helps to break up the trek to a degree. Traditional hiking gear and overnight camping equipment are a necessity on any Toubkal trek. You'll want a good pair of sturdy and comfortable hiking boots for instance, as well as comfortable hiking clothes that includes trekking pants and a breathable base layer. If you're climbing during the winter, you'll also want warmer gear, including winter boots, thick socks, a down jacket, and a warmer sleeping bag too. There are literally dozens of local trekking companies and guides that you can hire in Morocco that lead hikers up the mountain on a regular basis. Most are quite good at their job and take pride in what they do. But if you'd prefer to book a guide before you go, there are also some outstanding adventure travel companies that can handle all of the details for you. Here are a few that we recommend. 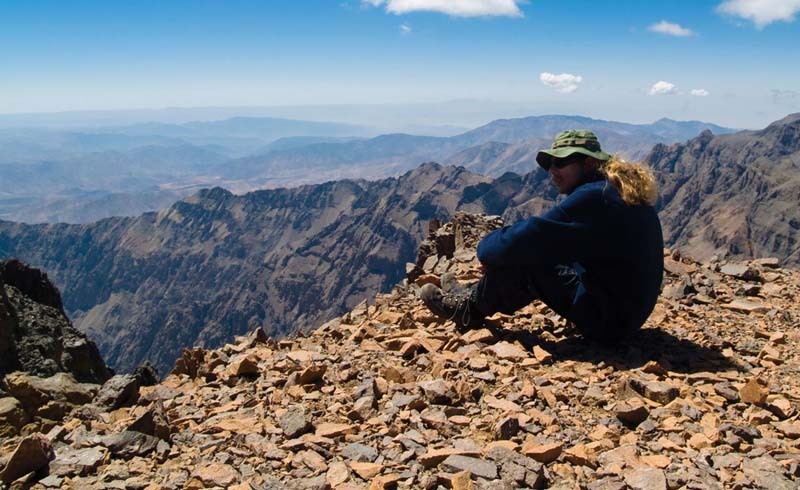 Intrepid Travel's Toubkal Trek is a bit longer than some others, but that's because its guides take climbers up a couple of other peaks in the Atlas Mountains first. This gives travelers a chance to acclimatize to the altitude prior to scaling North Africa's highest peak. This trip also includes a stay in a traditional Berber home and an opportunity to explore Marrakech more fully too. Based out of the U.K., Flash Pack specializes in organizing small group adventures for solo travelers in their 30s and 40s. The company's Toubkal trek is just five days in length, reasonably priced, and includes a day of unwinding at a luxury lodge in Marrakech after the climb. A leader in the adventure travel space for decades, Exodus Travel offers an eight-day trek up Toubkal that includes some pre-climb hiking through Moroccan villages, time to acclimatize prior to summit day, and bonus time in Marrakech. KE Adventure Travel boasts six different options for climbing Toubkal, including one itinerary specifically designed for teenage hikers. For the truly adventurous, the company even offers a winter ascent of the mountain, delivering a true mountaineering experience. For further options for trekking Toubkal search online for other itineraries and hiking companies.